I didn’t know the Oaks at Ojai was a serious weight-loss type of health spa when I accepted an invitation to come for a visit. Would I like to lose a few pounds? Sure. But losing weight was not my goal. 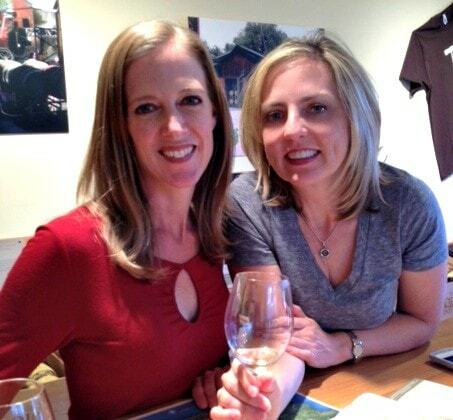 I invited my friend and neighbor, Sara, to accompany me for a gloriously kid-free weekend. We wanted to indulge in a retreat in Ojai, California doused with wine, tasty food, yoga, and spa treatments. And that’s just what we got. If you like your spa weekends to have a balance of naughty and nice, here’s how to have an indulgent girlfriend getaway at the Oaks at Ojai. 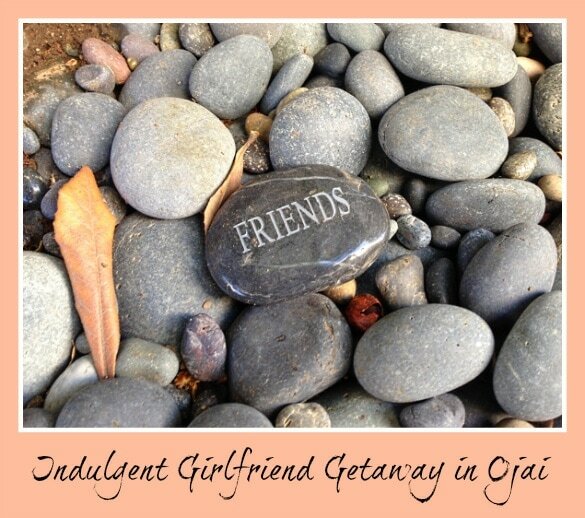 As we walked to our room, a FRIENDS rock in the rock garden at the Oaks at Ojai caught my eye. You are supposed to select a rock from the garden inscribed with various words, like PEACE or LOVE and make a wish upon it. I made a simple wish: to have a good time with my friend that weekend. It seemed a fitting start our girlfriend getaway. Before we left home, when Sara realized the spa offered a strict health food menu, she asked me, “Can we sneak wine and chocolate in our bags?” Of course we could, and did! A mini fridge in the living area was perfect for storing our contraband wine. Our room offered a private verandah, complete with a burbling fountain and two chaise lounges for soaking up sun. We each staked out our claim, stowing our clothing in the room’s two closets. Sara tucked “George” her body pillow in one of the two queen-sized beds. (George is so named for actor George Clooney, but don’t tell Sara’s husband, George that!). Bath-lovers will appreciate the casita’s full-sized tub, but Sara and I each stuck to the walk-in shower with its adobe tiles during our stay. An outdoor pool surrounded by lounge chairs beckoned to us. This oasis, however, was filled with nonstop water aerobics during our stay; apparently our visit happened to correspond with a water-themed exercise weekend. Water aerobics isn’t our bag, baby. A dip in the outdoor whirlpool spa, however, provided a lovely nightcap to evenings of girlfriend bonding. 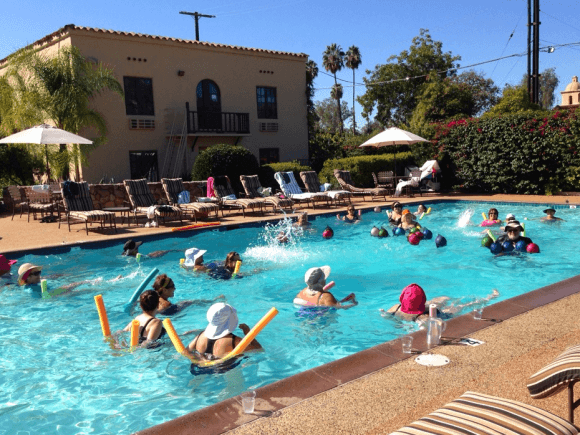 The Oaks at Ojai offers a daily schedule of exercise options. Choose from such classes as Pilates, Tai Chi, and Zumba Dance. A small gym has some standard equipment, but I never saw anyone using any of it. The Relaxing Yoga class was a wonderful way to unwind at the end of the day. You can also explore the area’s natural desert beauty with a hike. By looking at the map, Sara and I thought perhaps we could walk to Los Padres National Forest. Don’t let appearances fool you; you need to drive to the trailhead if you want to have any steam left to make it up the mountain. 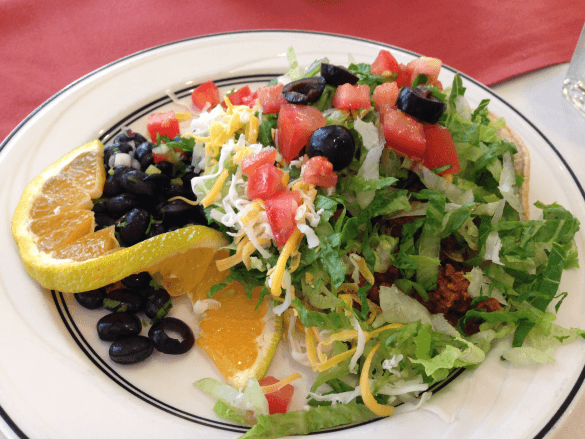 All meals and snacks are included in the price of your stay at the Oaks at Ojai. The all-inclusive budget-friendly spa does not serve alcohol, sugar or salt. 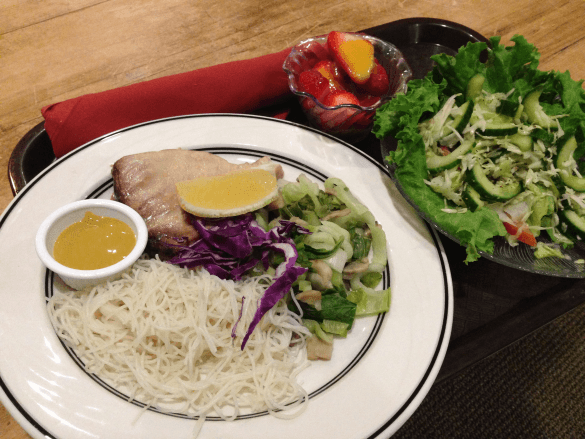 Daily suggested menus consist of just 1,000 calories. A high potassium vegetable broth is offered mid-morning and fresh veggies with dips are available each afternoon. If you have dietary restrictions, you can make specific requests in advance to receive a special food slip, which must be presented to the dining room at mealtimes. 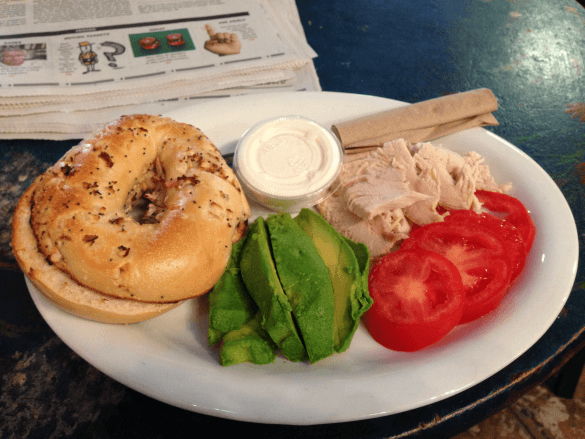 Sara and I opted out of the Oaks at Ojai’s healthy breakfast offerings, which include whole grain or gluten-free muffins, hard-boiled eggs, non-fat yogurt or cottage cheese, dried plums, fruit, oatmeal or Shredded Wheat. We did fill up our water bottles with cold green tea from the breakfast buffet before setting out to find more devilish dining options in town. The best meal we had at the spa, in my opinion, was a Mexican-themed lunch. The tortilla soup was flavorful and the ground turkey tostadas were not bad. They were served with shredded lettuce, tomatoes, a light sprinkling of cheese and black beans. For dessert we were served an orange-pineapple granita, which was a pleasant post-meal palate cleanser. If you want to drink wine with your dinner, ask for your plates to go. The spa will happily provide meals on to-go trays so you can eat in your room. Our first night we took our grilled swordfish, green salads and strawberries with lemon glaze back to our casita and toasted each other with our home-brought wine. We ate and chatted in our suite’s living room before a roaring gas fireplace. Sara ate her entire meal but I just picked at mine. I found the meal too bland. 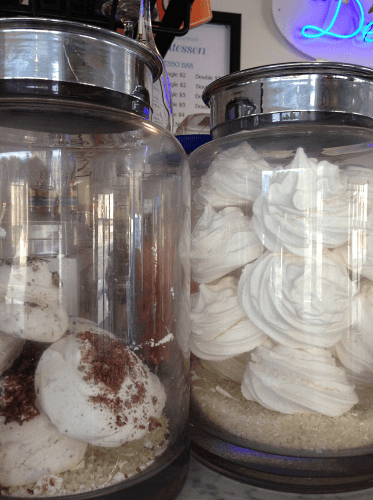 Be sure to nab a few packets of salt in town for spicing up your spa fare at if you want to opt out of the strict all-health-all-the-time menu. Sara and I both signed up for massages during our stay at the Oaks. Beforehand, I relaxed with a soak in the indoor whirlpool spa while Sara made use of the steam room. I opted for the Massage.Com, which is supposed to be specially designed for people like me who spend a lot of time at a keyboard. Too much emphasis was placed on rubbing the front of my neck so I’d opt for a standard massage instead, which Sara found delightful. 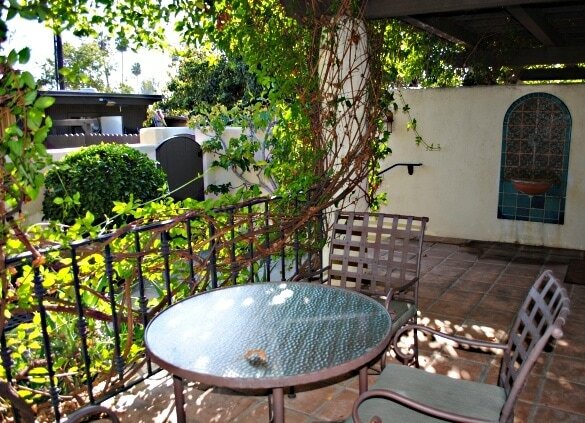 The Oaks is located in the middle of Ojai, making exploration easy. The tiny downtown area sports a laid-back, hippy appeal with coffee shops, a few greasy spoon diners, some hip bistros, wine tasting rooms, a crunchy grocery store, a handful of indie boutique clothing stores, and a used book shop or two. The town’s park provides a lovely space for stretching your legs. 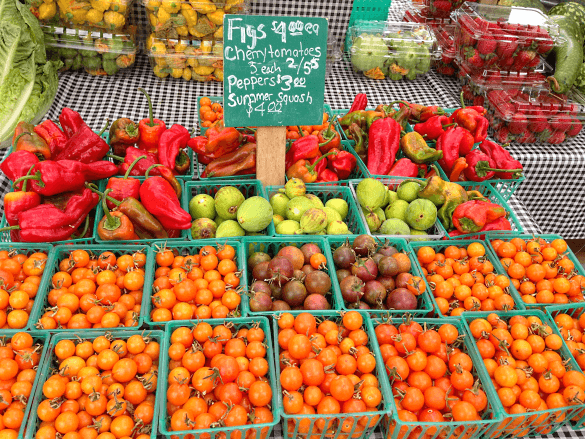 On Sundays, be sure to visit the Ojai Certified Farmers Market, which takes place every Sunday 9 am to 1 pm, rain or shine. The whole town, it seems, wanders through the outdoor booths to stock up on locally grown avocados, persimmons, flowers and other fresh goodies. Local artists also peddle their crafts and you can grab a loaf of fresh-baked multigrain bread or two. Sara has been an important fixture in my life since we started play dates with our kiddos five years ago. As neighbors, she and I hang out together often, but we rarely are able to finish more than a sentence or two before we are interrupted by the demands of our children. Between Friday night happy hours (where the mamas drink vino and eat cheese while our four children run amuck in our small SoCal backyards), to family dinner parties, and trips to our neighborhood park…we see a lot of each other. But we rarely go out together sans children. 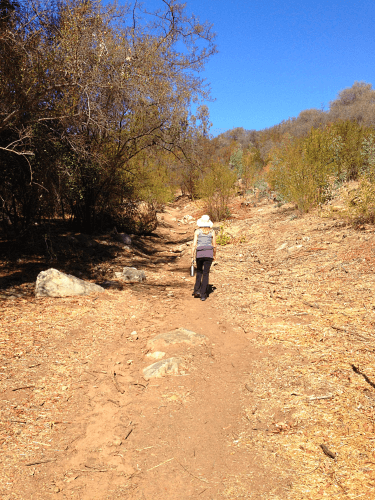 Did we lose any weight during our stay at the Oaks at Ojai? No. In fact, I may have gained a pound or two. But I also gained a deeper understanding of my friend in a relaxing, lovely environment. For me, that’s what a spa girlfriend getaway is all about. No matter if you are looking to lose weight, indulge, or just relax—The Oaks at Ojai is an affordable vacation option for a girlfriend getaway or solo trip. 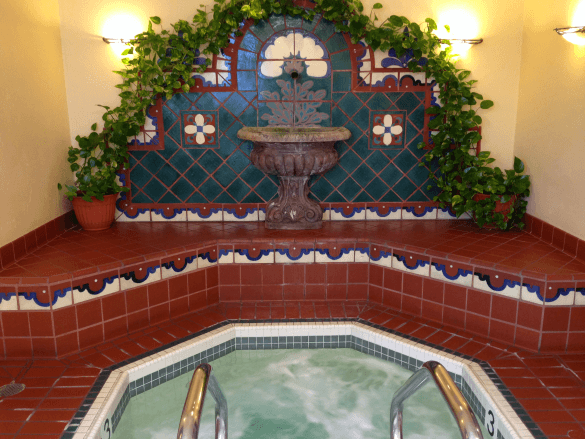 What’s your favorite part of a spa getaway? Let us know in the comments below! A Note from The Travel Mama: Our stay and my spa treatment were provided free of charge by the Oaks at Ojai for purposes of this review. All opinions are mine, as always. All photos by Colleen Lanin unless otherwise noted. Thanks again for an awesome girls weekend! Favorite parts were spa day and Sunday breakfast and the Farmer’s Market. 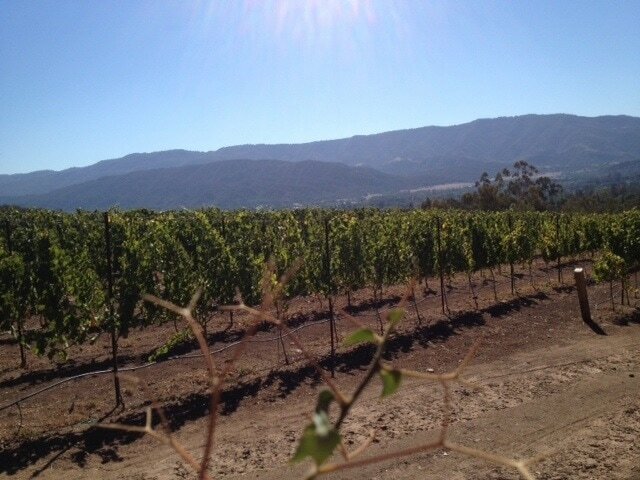 Ojai is quite a gem. As opposed to how we usually look, tense and haggard? Nah…just kidding. Sara always looks fabulous! Thanks for the great tips! Wine, salt, and chocolate are going to be the first thing packed into my bag! 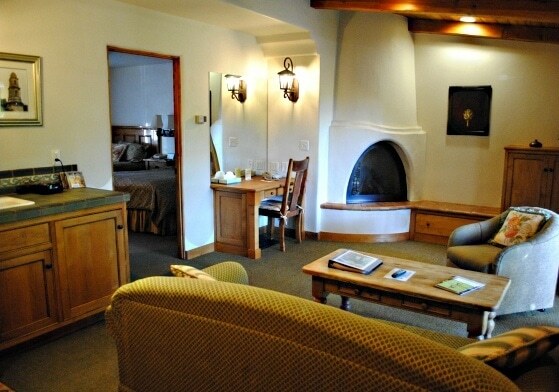 Enjoy your indulgent stay at the Oaks at Ojai!